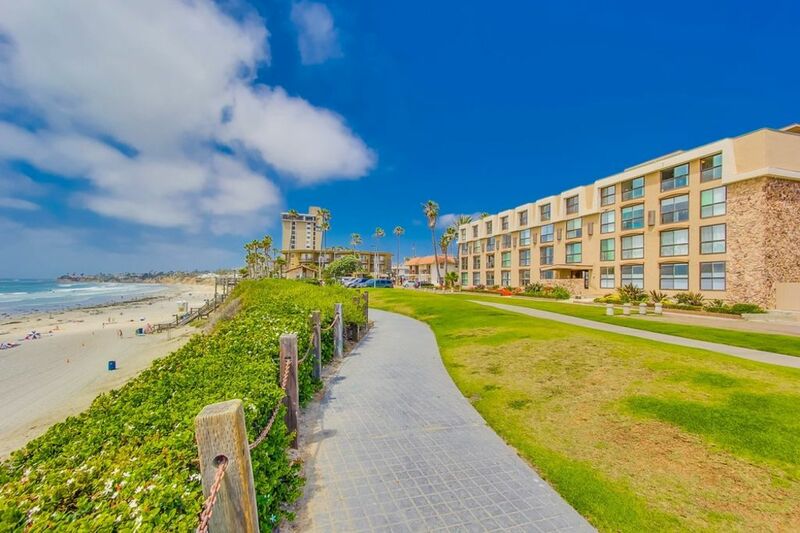 Bree's San Diego penthouse ocean front vacation rental is located just steps to the beach on the top floor of the Ocean Point Villas condo complex in Pacific Beach. Owner's Dave and Anna are excited to be able to share their family vacation condo with you for the first time starting spring 2011. They have outfitted the condo with everything you'll need to enjoy your vacation with all the comforts of home. Bree's condo is a unique property with 2 master suites that both have views of the ocean - fall asleep to the sound of the waves... and wake up to their sound too! The first suite has a king size bed and a shower. The second suite has a queen size bed with a twin trundle and a tub shower combo. Additional sleeping space includes a queen sofa couch - perfect for kids - in the living room. San Diego Ocean front Vacation Rental details: * Flat screen TV with cable and DVD, high speed cable internet with Wi-Fi, iPod docking station. Quality queen sofa-sleeper with tilt up feature for reading or watching TV in bed. * Dining table with 6 chairs is right by the floor-to-ceiling windows for dining, playing family games or just visiting...with an amazing ocean view! ASK us if this unit has AC! * We provide bikes, boogie boards, beach toys, beach towels and beach chairs. * The laundry room has 11 washers and dryers so you can do your laundry and be back out on the beach in no time flat! We are a family from the Midwest who love to travel. After falling in love with Pacific Beach, we decided to live out our dreams and invest in a condo here. In addition to sharing it with our 4 daughters for vacations, we have decided to open it up for others to enjoy our home as a vacation rental. We especially enjoy and appreciate the laid back atmosphere of Pacific Beach. How can you go wrong with the ideal weather, especially compared to the unpredictable Midwest weather? Some of our favorite things about Pacific Beach and the San Diego area include listening to the waves, watching the spectacular sunsets and surfers, keeping an eye out for dolphins right out our windows, walking to everything you could possibly need, great restaurants, hiking, photography, golfing, biking, people watching, whale watching, and the list goes on and on......Keep an eye out for the skateboarding dog on the boardwalk! 1 assigned spot in parking garage. Height limit 6'. ASK us if this unit has AC! Our trip to San Diego was overall a pleasant one. The weather was perfect and there were several activities around to enjoy. The condo had beautiful views and was comfortable for all our guests staying. We were grateful for the sand toys and games to enjoy for the kids as well as the beach items (chairs and umbrella) for the adults. The cons about our stay was that we experienced two power outages while there as well as several occasions when the elevator was not in service, which made it hard for hauling things up and down the stairs. My family and I had a wonderful time in San Diego. The location of the condo was better than we expected. There are many restaurants within walking, biking, or scooter distance as well as several attractions. We walked to dinner most nights then to Baked Bear for dessert. The pool and hot tub were an added bonus that we took advantage of. Thank you for the wonderful week! We absolutely loved our stay in this beachfront condo! Everything we needed for our home away from home for the week! We will definitely be returning in the future! Elevators are flakey at times, this made it hard to get our stuff to the garage where our car was when it was time to leave. I called it from the garage and it never came. I also sat in there and hit 4rth floor and it never moved. But it worked later just fine. We used the stairs most of time. The Beach outside is one of the best surfing beaches in SoCal. The issues is, if you are not a surfer (on a hard board), you have to swim much further down the beach (estimated eighth to quarter mile), this is because the beach in front of the place is reserved for surfing-only. We are very mobile so this wasnt an issue for us, but if you have mobility issues, you may be forced North an eighth to quarter mile. You can use the sand out front of the condo, but you arent allowed to swim there according to the lifeguards. Coffee Pot needs to be replaced. Its maddening trying to get the two piece lid to open and close. Its like a puzzle! Living Room Fan doesnt occilate anymore. It doesnt do a lot of cooling either. We replaced it with a fan from the closet that worked great. Broken Boogie Board. There is a dark-colored boogie board that was broken in-half upon arrival. We assumed it was a vacation rental refugee, no action necessary accept to possibly remove it. That being said, I would absolutely rent this condo again! Thanks for the feedback. We appreciate the time you took to give us detailed feedback. We have replaced the boogie board, fan, and coffee maker. There are designated surfing and swimming areas on the beach. The elevators will not work if it is windy. This issue is out of our control. Our apologies that they were not working the day of your arrival. Please call us during your stay next time, and we are happy to resolve any issues or deliver any missing items. We look forward to your next stay. Great location, quiet and perfect view. Twelve day stay was great. Condo was perfect for our needs with separate bedrooms, each with private bath. Kitchen completely stocked with all cooking needs. Quiet and relaxing. Staff kept in contact to assure every need was met and expectations met. We will stay here again. Thanks for your feedback. It is our pleasure to provide five star service. We invite you to stay with us again. Condo was great, common areas leave a lot to be desired. For location - 5 stars. It's directly on the boardwalk with a fabulous view of the ocean and pier. Nightlife, restaurants, and shops are an easy walking distance but far enough that you get a quiet night's rest. For the Condo itself - 4 stars. The accommodations were clean and comfortable and, for the most part, fairly spacious. We loved that every room overlooked the ocean. The Master bedroom has the sink area right in the bedroom, meaning if you get up prior to your mate, you're highly likely to wake them. The toilet/shower area of the Master is quite tight. For the Stocking of the Condo - 5 stars. I've stayed in numerous VRBOs and this was the most well-stocked. It even included many kitchen basics, such as coffee filters, spices, and tea bags. There were plenty of extra blankets and a nice supply of beach towels. For the Common Areas - 2 stars. The main lobby was dark, dank, and the carpet heavily stained. It reeked of a harsh cleaner. The elevator was tiny and in need of repair. It even included a sign that it doesn't work on windy days. The hallways and elevator were dirty. The garage door opener didn't work. The hot tub barely fits two people. The washers/driers are off the parking garage and require a lot of money to operate, making them hardly more convenient than the local laundromat. If the fact that these weren't in the unit was specified, I missed it. Thanks for your detailed feedback. We are happy you enjoyed the locateion and the stocking of the condo. After reading your full review, I think we deserve 4 stars, not 3 from your review. The HOA of the building is responsive to suggestions and they just redid all the windows and stucco on the outside of the building. I will inspect the carpet and give them feedback. There is one elevator and two staircases in this building. The elevator has been repaired. Our apologies for any inconvenience it may have caused you during your stay. The laundromat is basic and has standard prices. The laundry location is listed on the Orientation Guide. We also provide laundry detergent for our guest to use during their stay. Within 5-20 minutes is Sea World, the world famous San Diego Zoo, Balboa Park, Old Town with it's excellent Mexican Restaurants, Belmont Park & it's authentic 1920's wooden roller-coaster, Sea Port Village, downtown San Diego's Gas Lamp Quarter, the Convention Center & Petco Park. 30 min to Lego Land, 40 min to The Wild Animal Park and gambling casinos, 75 minutes to the quaint historic gold rush town of Julian, in the mountains, & another 30 minutes beyond that is beautiful Anza Borrego Desert State Park. Even Disneyland & Knotts Berry Farm can be done as a day trip. Mexico is only 25 minutes away. Local activities include Swimming, Snorkeling/Diving, Boating, Sailing, Water-skiing, Surfing, Windsurfing, Parasailing, Jet Skiing, Shelling, Hiking, Rock Climbing, Biking, Golf, Tennis, Fitness Center, Gym, Miniature Golf, Amusement Parks, Fishing, Wildlife Viewing, Horseback Riding, Shopping, Restaurants, Live Theater, Concerts, Cinemas, Museums, Sightseeing, & Indian Gaming Casinos.